Some of the nation's top strategic minds think Australia needs to shake-up its thinking in response to China’s unprecedented military build-up and influence in South-East Asia, but what could this look like? Defence Connect spoke to a range of experts with views on the matter. Australia's history of strategic policy has evolved since the end of the Second World War. Where the nation was once directly engaged in regional strategic affairs, actively deterring aggression and hostility in Malaya during the Konfrontasi and communist aggression in Korea and Vietnam as part of the 'Forward Defence' policy, growing domestic political changes following Vietnam saw a dramatic shift in the nation's defence policy, and the rise of the 'Defence of Australia' doctrine. This shift toward focusing on the direct defence of the Australian mainland dramatically altered the nation's approach to intervention in subsequent regional security matters. These included Australia's intervention in East Timor and later, to a lesser extent in the Solomon Islands and Fiji during the early-to-mid 2000s. Now, the rise of China, it's unprecedented military build-up, namely the development of key power projection capabilities, including aircraft carriers and supporting strike groups, fifth-generation combat aircraft, modernised land forces, area-access denial and strategic nuclear forces, combined with growing political and financial influence throughout the region is serving to shake-up Australia’s way of thinking. For the first time since the introduction of the 'Defence of Australia' doctrine, growing consensus is developing amongst Australia's strategic community in response to the growing power of China, that Australia needs to re-think its approach to politics, diplomacy and defence on the matter. In recent months and days, and for the first time since the introduction of the ‘Defence of Australia’ doctrine, there is increasing debate about what a “Plan B” for Australia might look like, in the face of both an increasingly assertive China and unpredictable United States. Leading a charge for change is Peter Jennings, Executive Director of ASPI, with the article 'Trump means we need a Plan B for Defence'; a recent article siting former senior-Defence bureaucrat, Brendan Sargeant; architect of the Dibb Report, which would inform the 'Defence of Australia' doctrine, Professor Paul Dibb; and finally recent calls made by Queensland, LNP Senate Candidate, Gerard Rennick for Australia to develop its own nuclear arsenal to act as a deterrent against future hostilities. In his article, which argues a need for Australia to think about a 'Plan B' in the face of mounting US instability under President Trump, Mr Jennings believes there is need for a shift in Australia's defence force structure and the corresponding doctrine to support the nation's increased role in the region. Speaking to Defence Connect, Jennings was quick to highlight that while the existing ADF was the most capable it has ever been, largely as a result of the material investment and operational engagements of the last two decades, there was room for improvement. "We need to be placing more effort into developing the long-range strike capability, this includes things like cruise missiles which can launched by platforms across the ADF. We also need to place greater emphasis on upgrading the capability provided by Collins, not just as a stop-gap, but as an imperative, as these submarines will continue to form the point of our deterrence spear for some time yet," he said. Jennings also encouraged more consideration and collaboration across government, Defence and industry to develop the capabilities we will need, not just in the immediate future but out to 2040. "While we have to ask what are the sorts of capabilities we can field now, we also have to ask what are the capabilities we will need to field in the future, out to 2040? This is where an organisation like DARPA becomes particularly powerful in helping the us to locally develop key technologies which will provide us with a tactical and strategic deterrent in the future," he explained. Echoing these calls, Malcolm Davis, Senior Analyst at ASPI, specialising in strategy and capability development, future warfare and military technology, Chinese military modernisation and Asian security, believes the growth of China's military capabilities and it's increasing influence in the region is a major concern. "We do need to think about doing more to share the regional strategic burden with the United States, particularly in the face of an assertive China, not only in the South China Sea, but also in the Indian Ocean and increasingly in the south Pacific," Davis said. "We need to have a more visible forward defence posture, working closely with our allies in Japan, India and Indonesia. This means we need to enlarge our forces, and see 2 per cent of GDP expenditure as the mandatory floor, not an aspirational goal." 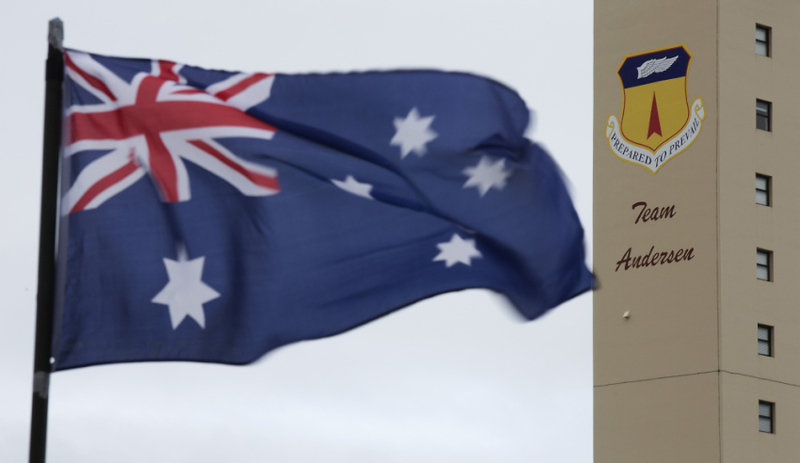 "We need to increase the permanent basing of key US forces, for example increasing the Marine Rotational Force in Darwin from 2,500 to 5,000 or even 7,500, increase the basing options for the US Air Force in northern Australia and US Navy in Freemantle," Davis said. When discussing the key capability gaps Australia needs to plug, in order to maximise the capabilities the nation can bring to the alliance, Davis reinforced that the 'air/sea gap' that serves as the moat and central defensive measure of 'Defence of Australia' no longer exists. In response, Davis believes Australia needs to work closely with the US: "The capability provided by the future submarines will be delivered too late, that means we need to work with the US on developing a potent air-based long-range strike capability." Author of the 1986 Dibb report, which outlined the 'air/sea gap' and laid the foundation for the largely defensive 'Defence of Australia' policy, Professor Paul Dibb of the ANU Strategic and Defence Studies Centre in a recent speech before an ANU hosted panel event 'Why Australia Needs a Radically New Defence Policy' recognised the need for the nation to develop and implement a new strategic posture in response to a number of factors, including growing regional instability. "First, we need to focus more on our own region of primary strategic concern, which includes south-east Asia (including the South China Sea), the eastern Indian Ocean, the south Pacific and the Southern Ocean," he said. Dibb described why he believes a re-focus is needed: "while aiming for greater defence self-reliance it is vital that we continue to have access to highly advanced American military equipment, combat systems and weapons, defence science, as well as intelligence and surveillance, to ensure that we maintain a margin of military advantage over our region." While Professor Dibb declined to directly articulate what kind of capability Australia needed to "maintain a margin of military advantage over our region" when asked by Defence Connect, his recent piece for ASPI, 'Should Australia develop its own nuclear deterrent? ', tentatively presented two long-range, strategic strike options. "The two most obvious delivery options are ballistic missiles launched from a nuclear-powered submarine, or a long-range nuclear cruise missile carried by a strategic bomber," he wrote. Professor Dibb's colleague and fellow guest speaker, Dr Richard Brabin-Smith, focused more on the industrial side of the equation, stating, "Industry would have a key role here, given its critical role in the [supply and] maintenance of much ADF equipment. Industry needs as well to make sure that it is secure, including from cyber attack. In a defence contingency, industry would need to be able to increase its rates of effort (i.e. have a surge capacity)." Additionally, Brabin-Smith sees a need to expand and upgrade existing critical defence infrastructure in the north of Australia, while also improving the reliability of existing fuel supplies, providing further avenues for industry to play a major role in Government's response to countering potential threats to critical Sea-Lines of Communication (SLOCs). "To my mind, the case for an Australian industry program would need to be thought through in detail, and would have to be compelling before the government should decide to go down such a path, not least because the likely costs and technical risks. Perhaps an international program could be considered," he said. It is clear that there is a growing ground swell from the nation's leading strategic policy thinkers that Australia must do more to guarantee its own security.